Post-traumatic stress disorder affects every sufferer in a different way. A veteran who committed atrocities during war may not benefit from cognitive treatments in the same way a victim of sexual assault might. For each type of trauma, there is an appropriate type of treatment-and the best treatment may not lie entirely within one therapeutic modality. Written by a psychologist who specializes in trauma, this book combines the best of acceptance and commitment therapy (ACT), dialectical behaviour therapy (DBT), and cognitive behaviour therapy (CBT). It offers the best skills for specific symptoms so readers get the quickest relief from flashbacks, insomnia, and other symptoms, and so will have the best chance of recovery. "Sheela Raja has produced an excellent resource for the many individuals suffering from emotional consequences of trauma that do not have access to, cannot afford, or prefer not to utilize traditional mental health services. Her book is long overdue in self-help literature. It is grounded in, and supported by, the best available research related to trauma treatment approaches. Readers can rest comfortably knowing that this is the relatively rare book written for trauma survivors that includes techniques proven to be invaluably helpful for countless others suffering from similar difficulties. They can be assured that exercises recommended in this book are bolstered by cutting-edge scientific research. Overcoming Trauma and PTSD is truly an invaluable resource--one that I will use often and recommend highly." --Matt J. Gray, PhD, director of clinical training and professor of psychology at the University of Wyoming "Sheela Raja has written an accessible, clear, and compassionate book that successfully integrates important evidence-based techniques for the treatment of PTSD. She does an excellent job explaining techniques so that people can use them on their own, while also providing important guidance about when (and how) to seek professional help." 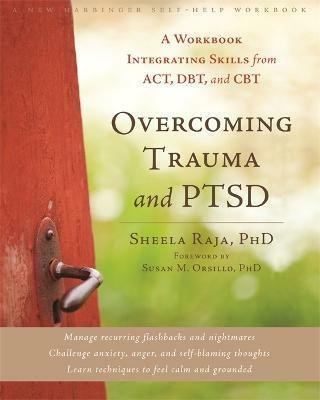 --Holly K. Orcutt, PhD, professor of psychology at Northern Illinois University "Relying upon the growing body of evidence-based psychological treatments for PTSD, psychologist Sheela Raja assembles a treasure trove of useful exercises and skills for people committed to recovery. This workbook is an invaluable tool to accompany psychotherapy and will prove to be an outstanding complement to existing self-help manuals. Utilizing an integrated framework for promoting behavioral health, Raja's clinical skill and expertise resounds throughout the text. This is an important reference for patients and clinicians alike." Sheela Raja, PhD, is a licensed clinical psychologist and assistant professor at the University of Illinois at Chicago. She completed internship and post-doctoral training at the National Centre for Post-Traumatic Stress Disorder in Boston, MA, and has published numerous articles exploring the relationship between physical health and traumatic events. Raja has a passion for making evidence-based psychology accessible and is a frequent contributor to various print and national television media outlets.